A Monster of a Telescope That Has It All! 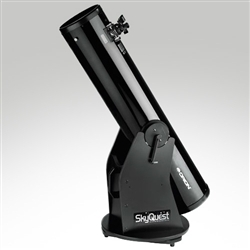 A powerful and capable telescope, the Orion SkyQuest XT8 Classic Dobsonian is one of our most popular models for the Pro due to its elegant combination of precision optics, mechanical simplicity, and rock-solid stability. You and your whole family will appreciate the bright, clear views of the night sky provided by the XT8 Classic Dobsonian reflector. The Moon and planets of our solar system like Jupiter, Saturn, and Mars shine brightly in the SkyQuest XT8 Classic, allowing you to inspect them in detail. The XT8’s 8" aperture is also large enough to gather a significant amount of light from more distant celestial objects for great views of sparkling star clusters, cloudy nebulas, and faraway galaxies. 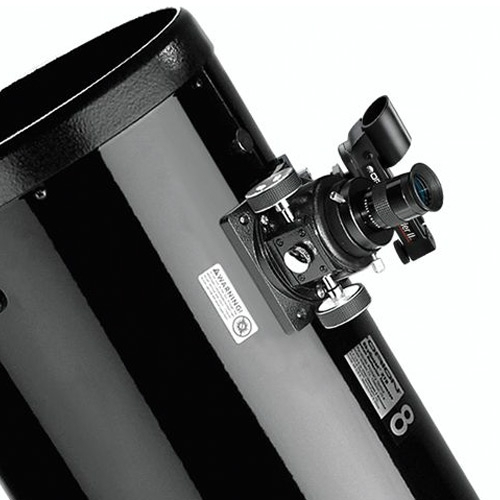 The XT8 Classic Dobsonian is a tremendous value considering the high quality views it provides on such a wide variety of celestial objects. This telescope has it all! The SkyQuest XT8 Classic Dobsonian is built around an 8" (203mm) diameter parabolic primary mirror mounted in a cast-aluminum support cell. 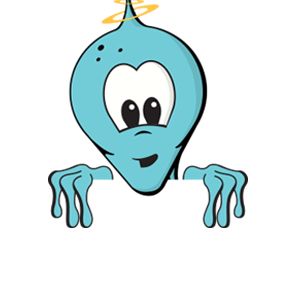 The mirror collects 78% more light than a 6" mirror, so you get a significant increase in ability to observe dust lanes in nebulas, resolve the cores of prominent globular star clusters, and to reveal some of the more subtle structures in faint galaxies. The 1200mm focal length (f/5.9) XT8 mirror allows you to obtain clear and crisp views at moderate to high magnifications on clear nights with good seeing conditions. Enhanced-reflectivity mirror coatings boost the XT8 Classic Dobsonian’s mirror to 94% reflectivity so as much light as possible is transmitted to the eyepiece, for clear and bright views. The Dobsonian base of the XT8 Classic provides a simple and stable low-profile altazimuth platform for the 8" aperture reflector optical tube. The tube attaches securely to the base by virtue of Orion’s CorrecTension Friction Optimization system, which utilizes heavy-duty springs to both securely couple the tube to the base, and to keep the telescope in constant balance to avoid drifting during observations. Even with large 2" eyepieces and accessories installed, the XT8 Dobsonian telescope optical tube will remain balanced throughout your viewing sessions. 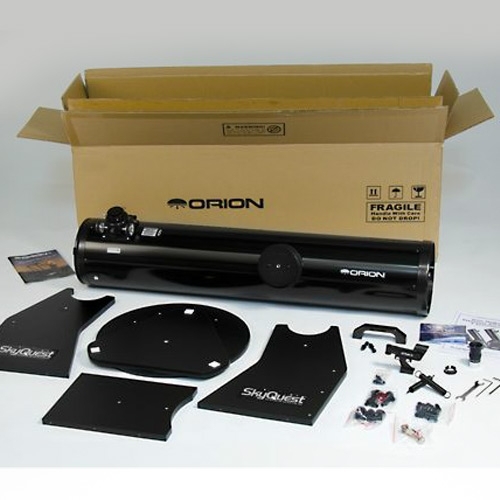 The Orion XT8 Classic Dobsonian telescope can conveniently be separated into two pieces for easy transport and storage. By unhooking the two CorrecTension springs from the Dobsonian base you can detach the 46.5" long optical tube. 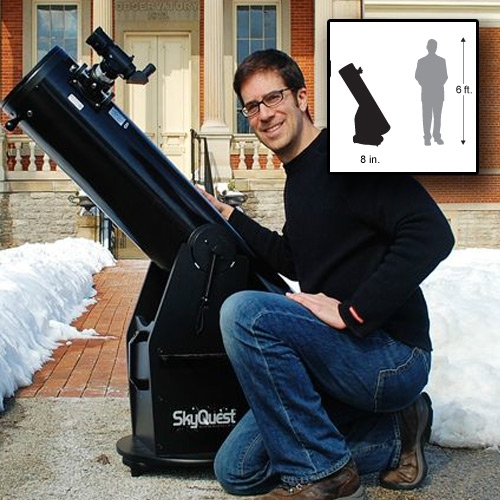 The XT8 reflector optical tube weighs 20.3 lbs., while the 19" diameter Dobsonian base tips the scales at 20.7 lbs. With an assembled weight of 41 lbs., the XT8 Classic Dobsonian can be easily moved to and from your favorite observing site, whether it’s just a few steps out the back door, or many miles down the road. Length of optical tube - 46.5 in. Weight, optical tube - 20.3 lbs. Weight, mount/tripod - 20.7 lbs. Weight, fully assembled - 41.0 lbs. Pro features with a large aperture Classic Dobsonian reflector telescope at a very affordable price!